I’m definitely one of those people who’s always trying different face washes and scrubs, always striving to find the best one for my skin type. Fyi, I have combination skin, my T-zone is so oily you could fry an egg on it and my cheeks are so dry they just feel gross and flakey 99.99% of the time. I’m pretty sure I mentioned this in a previous post, but just in case you missed it, I work at this really great place called the Gibraltar Soap Shop and one of our products is this bad boy. 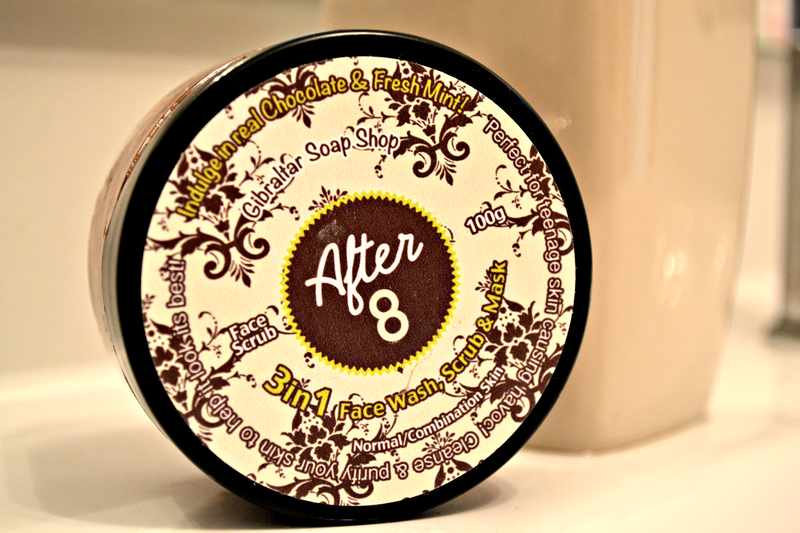 After 8 is a 3in1 face wash, scrub and mask, best suited for normal and combination skin. Made using real chocolate and mint leaves, meaning it smells just like those naughty after 8 chocolates that everyone’s mum buys at Christmas! Basically it smells delicious, i’m sat here writing this with the pot in hand, having a good whiff every now and then, just to tease my taste buds! Please don’t taste it, it’s not very nice and please don’t ask why I tried it, I just did. But is it any good? Well, yes it is! In fact, it’s become such an important part of my skin routine. I use After 8 twice a week as a face wash and scrub, I simply rub onto a wet face and then rinse off with warm water and viola! Not only can you smell the deliciousness that is this little pot of joy, but your skin feels smooth, cleansed and refreshed! I personally prefer this product used as a wash and scrub but it’s equally effective as a face mask, i’m just impatient! I really feel like this product gets into my pores and removes all the excess oil and dirt that’s hiding in them, sorry that sounds a bit gross but it’s true! At the same time it seems to give moisture to my dry patches, honestly it’s like magic. I’ve also found that it lasts a really long time, there’s still just under half left and like I said before, i’ve been using it two to three times a week. You really only need such a small amount, especially for a wash and scrub. The only fault in this product is that you can’t eat it, haha! Such a great product and did I mention that it’s all natural ingredients, The Gibraltar Soap Shop don’t test any of their product on animals and this product is suitable for vegans, woohoo! If you’re in Gibraltar, you can grab yourself a pot now for £7.99 from The Gibraltar Soap Shop, 61 Main Street, Gibraltar. If you’re not on our little rock but you are interested in purchasing one of these bad boys, drop me an email (maisieejo@hotmail.com) and i’ll see what I can do for you! 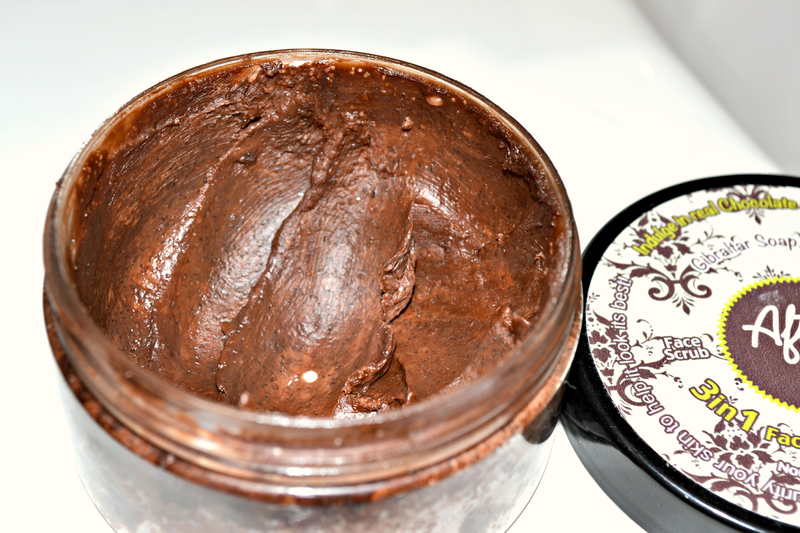 Have you tried out this little pot of dreams? Or are you thinking of purchasing it now? Let me know! *Disclaimer: Although I work for the said company, all views and opinions are of my own and not a representation of The Gibraltar Soap Shop. I would never give a false opinion on a product review, no matter what connection I have with the company. I loooove the sound of this! Anything chocolately – I'm there. I also have combo skin so feel this would work great for me. Will look into this! when i was this popping up on my feed i though 'this must smell amazing' and in fact, it also looks amazing and that it works good aswell, makes it even better. I think the sound of this product is making me hungry haha! Sounds amazingly yummy! oh my gosh….this stuff looks amazing!! I need to order myself some…fingers crossed they ship to Canada.